I am a mother. Which under the Sonia Kruger manifesto make me a font of wisdom on pretty much any topic. "Take me as you see me". I first wrote a version of this piece five years ago when Julia Gillard was being called horrible names due to her child-free status. But the site it was on has been archived so here I am in 2017 having to write it again. 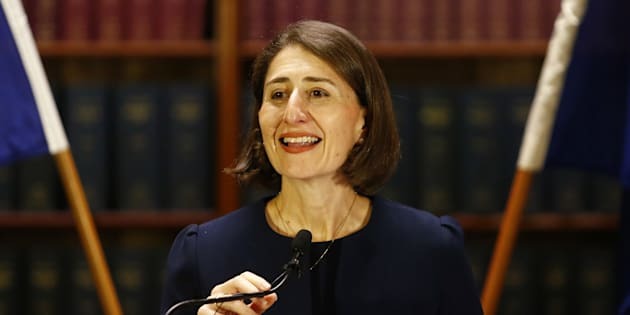 Yesterday NSW got a new Premier, who happens to be a woman who has not had children. It took just 15 minutes into her first press conference for a journalist to ask her about her lack of offspring. Take me as you see me. [New deputy] Dominic Perrottet has made up for me, he has four kids. I am someone who has always been myself. Not all of us can plan how our life turns out. I am a very happy person. If you asked me 20 years ago, would my life look like this? It probably wouldn't be how it looks like. But I am grateful for the opportunities I have had. I also want to say again, not because I have to but because I want to, the closest people in my life are my family. I am not going to judge anybody on their personal circumstances. I am here to govern for everybody and I hope that people judge me on my merits and what I can do. Breastfeeding is a lot harder than it looks. Sometimes when babies and toddlers cry they're just trying it on. Hummus counts as a serve of vegetables. Some weird things happen to your body during pregnancy that no one tells you about. A good education can be life-changing and should be available to all children. The health care we have available to us is better than most people on the planet have access to, but we must be vigilant to make sure it stays that way. Lots of parents have to sacrifice their own wellbeing to provide their children with essentials such as dental treatment and healthy food. Many kids arrive at school each day hungry. Reproductive health is not separate to health. We need good public transport. We need community spaces that are safe. A barrier to a mother's contribution to the workforce is a lack of affordable, quality childcare. Our economy would be stronger if mothers could contribute more to the workforce. The formula for effective policing and courts is complicated and fraught. There are people who lie awake at night thinking about how to keep us safe from terrorists. Sydney's NYE fireworks are the best. As you can see, the first list isn't much use to the Premier of Australia's most populous state. Let's instead see how she stacks up on the second.